Despite numerous attempts by successive governments to reform the system, social care remains in crisis and under constant pressure – both financially and in terms of demand. With the government due to publish its long-awaited green paper this year, the actuarial profession has an essential role to play in offering a unique perspective on potential long-term funding solutions. 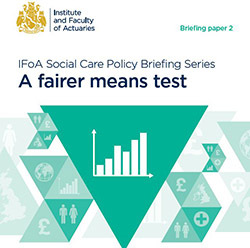 Read our latest briefing which explores the social care means test. Read our first briefing on the demographic, financial and societal challenges facing the social care system. • An overview of various funding options, including the IFoA “all inclusive” care cap. • A synopsis of how other countries address the challenge of later life care. 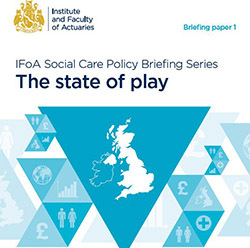 This briefing series brings together the work the IFoA has undertaken to help inform the debate in preparation for, and during, the green paper process. This initial briefing considers the problems facing the government. Further briefings will follow over the coming months: on how means-testing could be made fairer, on potential funding solutions (including the IFoA’s proposal for an ‘all-inclusive’ cap), the use of financial products, and how we can learn from other countries facing similar challenges. Efforts should be made to improve the public’s understanding of the risks and costs associated with social care (as well as the solutions) and to clearly outline who is responsible for meeting any potential needs, ie the state or the individual. Given the diverse needs and circumstances of those requiring care, the government should consider multiple funding solutions. These might include one (or more) solution(s) for those already in retirement or with care needs, and one (or more) for the working population with potential future care needs. A combination of approaches will avoid exacerbating issues around intergenerational fairness. We would caution the government against asking younger generations to bear a disproportionate amount of the costs of supporting future older generations, particularly given the projected shrinking tax base over the coming decades. The government should consider how it can help remove any existing barriers associated with the use of insurance and savings-based products and solutions, particularly for those who are able to self-fund, as well as how older people could effectively and efficiently use the wealth they may have accumulated through property and pension assets. As proposed under the Care Act 2014, the means test should be implemented as soon as possible to reduce the disincentives to save for those with lower levels of assets.